The legendary cornetist Bix Beiderbecke (1903-1931) had a determining influence on many other jazz musicians during the 1920s; some of these were lucky enough to have heard Bix first-hand, while others became familiar with his unique style through recordings. Records featuring Bix’s solos were first issued in the USA in 1924, and by the late 1920s his lyrical style of playing was also becoming influential in Europe through records issued there. 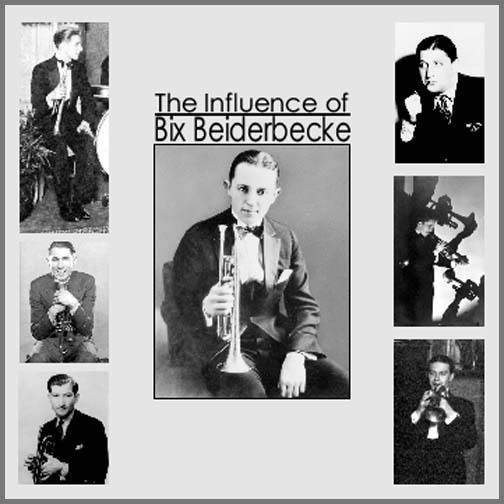 Therefore, “The Influence of Bix Beiderbecke” contains two CDs, one concentrating on the recordings of American jazz musicians and the other on records made by European musicians under the spell of Bix. The CD-set contains many rare tracks that are being re-issued for the first time since their original release on 78 rpm record. Indeed, a number of sides are transferred from unissued test pressings and are being released for the first time ever, including two recently discovered unissued test pressings by Fred Elizalde and his Music. All show the important influence of Bix during his short lifetime. The recordings have been faithfully restored using the latest digital techniques while at the same time paying respect to sound of the original recordings. The CD-set is completed by two in-depth booklets (one of 28 pages and one of 36 pages) explaining the importance of Bix's work and the crucial effect his playing had on other jazz musicians; both booklets are replete with many rare photographs, some reproduced in print for the first time. 2. Where’s My Sweetie Hiding? 12. Why Do I Love You? All the profits from this set of CDs will go towards helping to meet the on-going medical expenses for respected author and jazz musician Richard Sudhalter, who is an authority on Bix Beiderbecke and has done much to bring Bix’s life and music to wider audiences. Richard Sudhalter’s works include “Bix, Man and Legend”, which was written in collaboration with Philip R. Evans and first published by Arlington Press in 1974, “Lost Chords: White Musicians and Their Contribution to Jazz, 1915-1945,” (Oxford University Press, 1999) and “Stardust Melody: The Life and Music of Hoagy Carmichael” (Oxford University Press, 2002). Sudhalter is also a much acclaimed musician whose Bix-influenced cornet and trumpet solos have graced numerous recordings. Sadly, Richard Sudhalter suffered a massive stroke in 2003. Although he recovered initially, in the last three years Richard’s health has deteriorated considerably. He has been diagnosed as having MSA, multiple system atrophy. Currently, Richard lives in a nursing home in New York City. Order this CD set by using the following form. The Influence of Bix Beiderbecke, Volumes One and Two. If you are paying by check or money order, please copy, paste and print the following form. Tick or cross through the appropriate boxes. Please note that we cannot accept checks in Euros (though we can accept Paypal payments in Euros). Payment by cash is accepted, but we do not advise the sending of cash through the postal system, and customers do so at their own risk. Payment by any other means (e.g. credit card) is not acceptable. Please contact either Nick Dellow at nick.dellow@gmail.com or Albert Haim at ahaim@bixography.com for further information.